RAID drill and rod modules. They held up tight over the winter. Uncovered on the left, and still under wraps on the right. Our drilling crew is working hard to get things ready for the traverse to Minna Bluff. They removed tarps from the modules, fired up the generators, unpacked the ‘do-not-freeze’ items for re-installation, resupplying the shop, cut some new rig mats, laid in some new hoses, and started the never-ending process of sorting, organizing, and connecting the myriad parts and components. Of course, it’s never possible to work on a normal schedule in Antarctica. 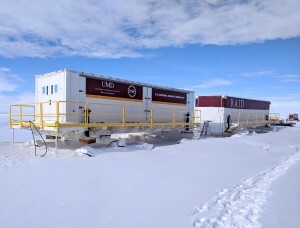 Lately they have been interrupted by bad weather conditions (rated at Condition 2 and, the most severe, Condition 1), the mandatory training sessions, and even the holiday celebrations in McMurdo. As is common, there are also lots of surprises waiting. 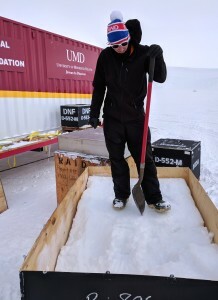 After opening up a storage crate, the crew found it packed with snow that blew in over the winter through cracks sealed tight! AJ looks skeptical about the prospect of digging it out. ‘Ops normal’ for Antarctica. 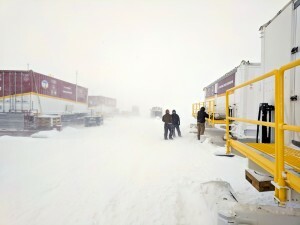 Condition 2 — blowing snow and whiteout conditions away from the drilling modules. A winter-over crate packed with snow. AJ is wondering how important the contents of this crate really are. Hopefully the traverse will depart on time on Nov 25 and have a safe trip over to Minna Bluff. It’s about 100 miles, give or take, but will likely take 3 days to complete. Wish them luck!